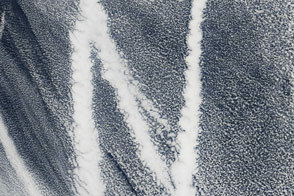 Today’s Image of the Day is derived from our newest feature: Reading the ABCs from Space. If you are a volcanologist, Taal may come to mind. Located about 70 kilometers (40 miles) south of Manila, the complex of stratovolcanoes is one of the most active and dangerous volcanic sites in the Philippines. In 1911, a massive eruption killed 1,334 people and dropped significant amounts of ash on Manila. Since then, Taal has erupted eight other times, most recently in 1977. Much farther north along the Ring of Fire is Tolbachik, one of the largest and most active of the Kamchatka Peninsula’s many volcanoes. Tolbachik last erupted in November 2012, with the eruption continuing well through August 2013. The volcano is located in a remote part of Russia, so few people were directly affected. If you are a meteorologist, it may well be tropical cyclones, typhoons, tornadoes, or thunderstorms that come to mind instead. 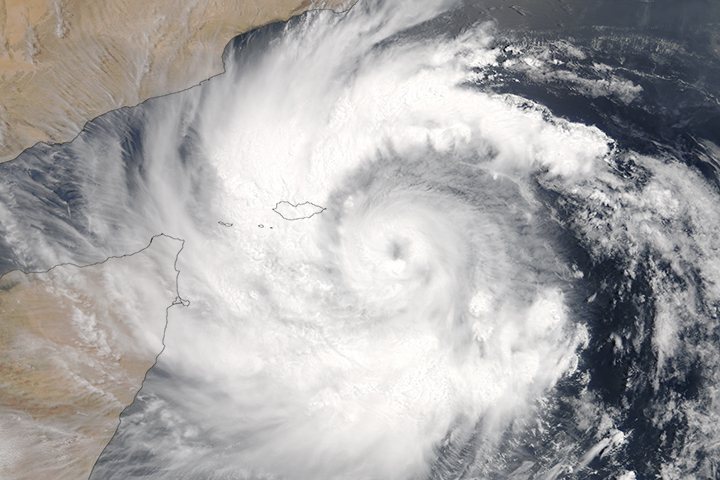 Tropical cyclone is a general term for the low-pressure cyclonic storms that regularly bring devastating winds and flooding rains to coastal areas. 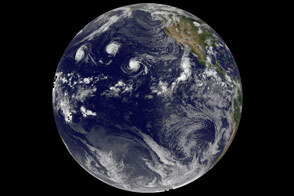 In some parts of the Pacific Ocean basin, these storm systems are called typhoons; in the Bay of Bengal and the Arabian Sea, the preferred term is cyclone; in the Atlantic Ocean basin, it is hurricane. In comparison to tropical cyclones, thunderstorms are smaller, more localized events. Thunderstorms invariably come from cumulonimbus clouds. They produce thunder, lightning, bursts of rain, gusty winds, and sometimes hail. 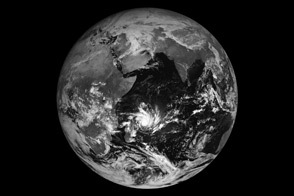 To see how the scale of thunderstorms and tropical cyclones compare, see this Meteosat image that shows examples of both types of storm. 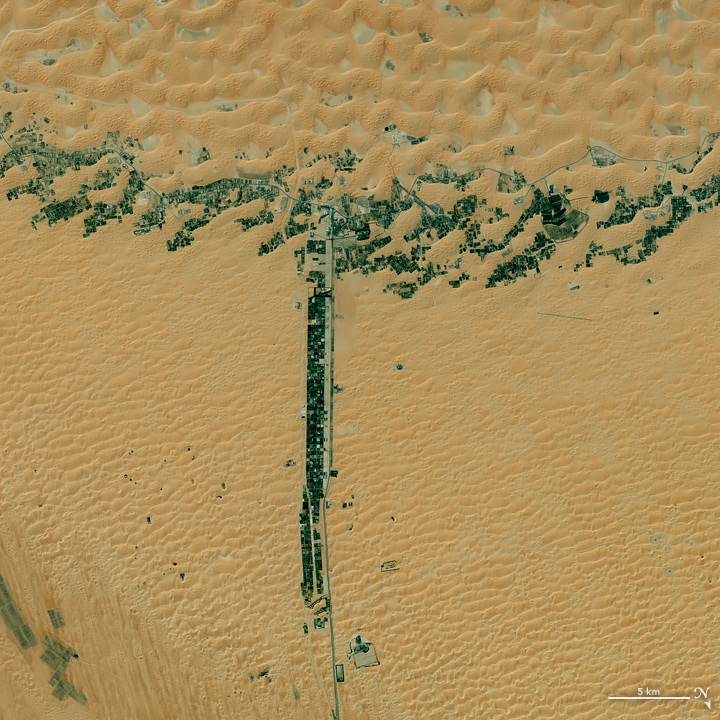 Finally, of course, there is this trove of trees and towns tucked into the tan terrain of the United Arab Emirates. The image, which has been rotated, is centered near 23.175 degrees North and 53.798 degrees East. 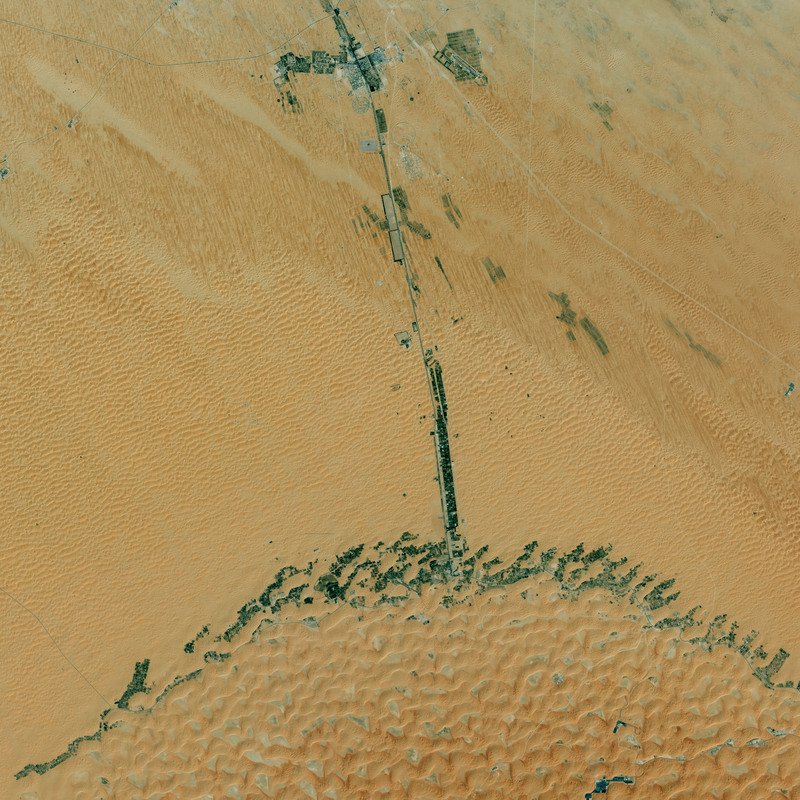 The T is formed by greenery (in many cases date trees) planted along highway E45 and the arc-shaped Liwa oasis in the emirate of Abu Dhabi. The Operational Land Imager (OLI) on Landsat 8 captured the image on March 9, 2015. 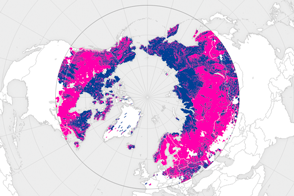 Click here to see our entire satellite alphabet gallery. What begins with T? Taal, Tolbachik, and trees amidst this tan terrain.